Michael McFadyen's Scuba Diving - Fish Soup, North West Rock On 15 May 1770, Lieutenant James Cook, RN, in His Majesty's Bark Endeavour was sailing up the New South Wales coast. Just before dark he sighted a number of small islands. He named these islands South Solitary Island and (I think) Split Solitary Island. The group of islands were named, not surprisingly, the Solitary Islands. Located to the north of Coffs Harbour, the islands are split into two distinct groups, the South Solitaries and the North Solitaries. I have dived the both and can report that the diving around the whole area is absolutely magnificient. North Solitary Island is located about 23 kilometres from Arrawarra Beach and it can be a bit of a problem when the weather is not fully suitable. However, even when the seas are a bit choppy and the ride wet and uncomfortable, the effort is well worth the trip. You can also come from Wooli which is about 14 kilometres kilometres. North Solitary Island is really two islands, separated by a small channel (see The Boulders article for more info). About one kilometre off the northern end of North Solitary Island is North West Rock or "The Mouse". Like its bigger brother, North West Rock is also split into two parts. 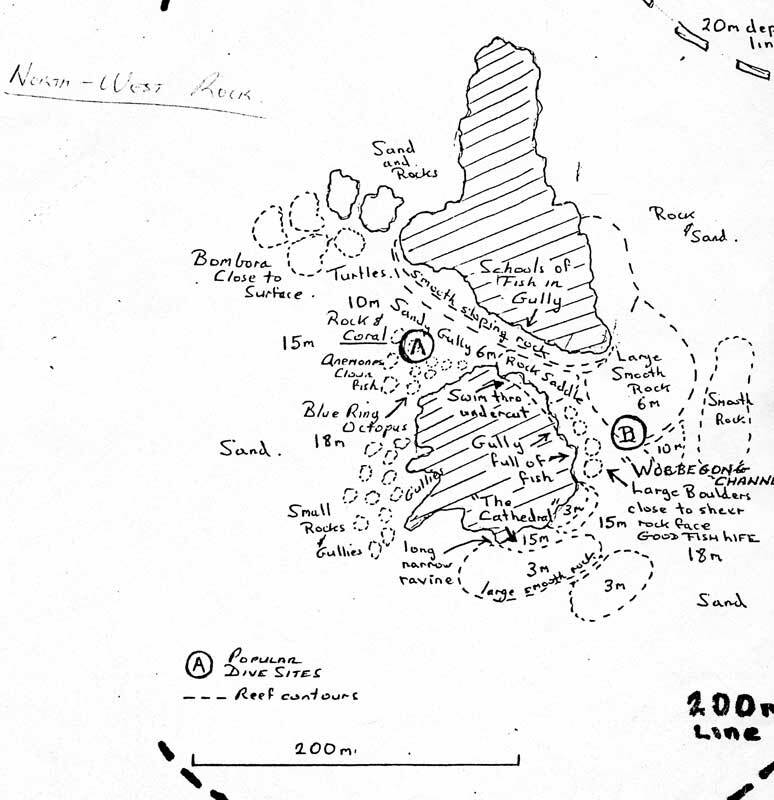 However, unlike North Solitary, this is not an island but a large rock about the size of a two storey house and a series of smaller rocks to the north separated by a channel about 10 metres wide on the surface. See the photograph at left. To do this dive you need fairly calm seas so that you can swim through the split from the western side to the eastern side (Fish Soup). As there is nearly always a current on the eastern side, you cannot dive this side in the normal manner as you are prone to be washed away to the south. Travel to GPS Reading 29° 54' 50" S and longitude of 153° 22' 55" E. Note that all the GPS Readings on my Web Site are taken using AUS66 as the map datum. If you use another datum you may be about 220 metres off the site. See my GPS Page for more details and how to convert readings. The dive here is generally done as a second dive as the water is much shallower than North Solitary Island. After mooring on the western side of the rock, you drop to the bottom (depth 15 metres) and swim due east. This takes you to the channel and the depth comes up to 10 metres. You pass over a fair bit of hard coral and on your right there is a shear wall and the left side is a gentle slope. After 20 or 30 metres you are over a sandy/broken shell bottom and right in the split between the two parts. Eight metres sees you over the "hump" and on the eastern side of the rock and in Fish Soup. On your right hand side there is a low cave and you can sometimes see a small Queensland groper. Look hard and you might see it. As you swim along to the south following the shear wall you drop gradually to 16 metres. There are a number of large rocks just off the wall making some nice swim-throughs and a few overhangs. As you swim along, the fishlife around and over you is certainly prolific. The whole water seems to be alive with fish. 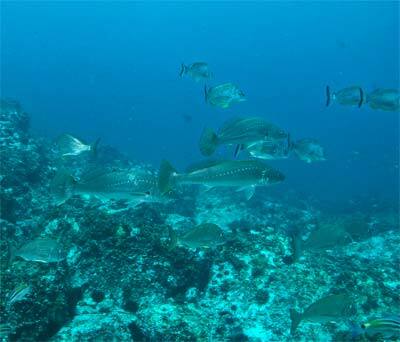 There are huge schools of yellowtail, trevally, big eyes, giant sweetlips and other fish like silver sweep making the area one of the most densely populated dive sites I have ever seen. You may also see schools of yellowtail kingfish coming in and checking you out as well as schools of huge jewfish. As you reach the 16 metre mark you will generally turn around as there is often (in fact most times) a current from the north which makes it dangerous to dive past this spot. As you turn, you see enormous schools of bream on the gently sloping wall to the north. They swim back and forth, forever cruising the area. It is time to swim back through the gap to the western side of the rock. Despite the surge, it is quite easy to make your way back to the mooring. Unless you are an absolute air guts, you should still have time to spend a good deal of time in the area around the mooring. On my last dive here we headed to the north of the mooring and through the small gap between the smaller rock and a bombora that lies off its western side. It was a hard swim as the current (which I mentioned in the last paragraph) also sweeps through here. About 30 metres takes you to the northern side of the bommie and it is then a swift drift back around the the bommie to the mooring. I have spent in excess of 45 minutes in the 20 or so metres around the mooring just watching clownfish in their anenomes. If you look carefully, you can find some incredible fish on the sand, including a goby that builds a "well" like structure of small bits of coral, holds its eggs in its mouth and seems as interested in divers as divers are in them. Amazing. There are other gobies that have a symbiotic relationship with alpheid shrimps sharing a hole for a home (the gobies guard the hole while the shrimp digs like a minature bulldozer - the shrimp is generally blind and the gobies acts as a guide/guard and the goby benefits from having its house built for it). Simply fascinating! I once spent the last 10 minutes of a dive here listening to a humpback whale singing its haunting songs. I could not believe that I could hear it so clearly, it was a great end ot a fantastic dive. North West Rock is a great dive site, one of the best I have ever dived and worth travelling a long way to experence. 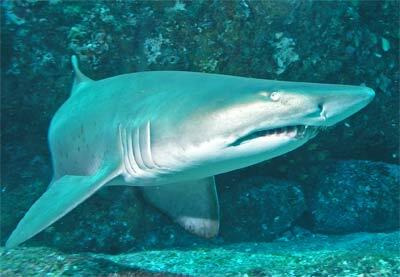 The Solitary Islands are one of the truely great dive locations and more than the equal of any overseas reef dive. If you ever do one dive trip, give the Solitaries a go. 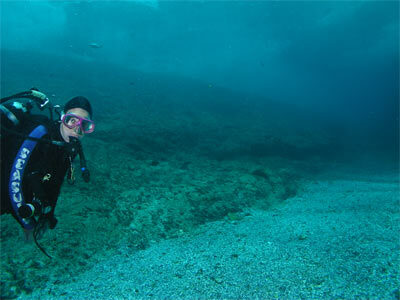 If you are contemplating a dive trip to northern NSW and want really great diving, you should consider visiting Dive Quest at Mullaway (02 6654 1930). You will get not only excellent diving, but first class and friendly service.